Today (Friday 16th May) we visited the Walpole-Nornalup National Park, (we now have permit for Skye in WA National Parks) and the Valley of the Giants treetop walk which was interesting (if a bit shaky) but the Ancient Empire walk had the more impressive older trees. These "tingle" trees (Eucalyptus Jacksonii) are only found in this area now. The very shallow root system of the tingle trees, hence their wide base (up to 20 metres circumference). 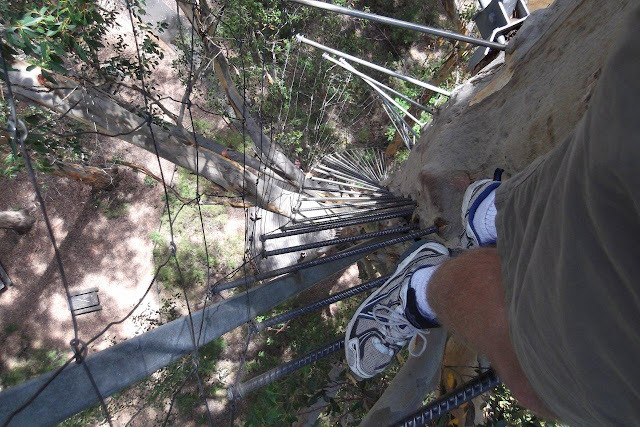 Hanging on for my life near the top of the Valley of the Giants treetop walk. Gloucester Tree near Pemberton (previously used as a fire watchtower) — and NO I didn't climb it.